March 5, 2015, 12:01 a.m.
A reminder for people who talk about media: From Denver to Sioux City, local TV is the largest source for local news. Social media and digital startups are bit players by comparison. By Justin Ellis @JustinNXT March 5, 2015, 12:01 a.m. If you’re looking for the latest information on local weather, crime, or education, the place you turn for news likely depends on the options around you. In a targeted look at how residents read and react to local news, a new study from the Pew Research Center finds that almost 9 in 10 people follow local news closely, and that many still rely on TV and their daily newspaper. To be certain, this study is an unusually targeted window into the lives of news consumers. Researchers studied the media habits of people in three geographically and demographically different areas: Denver; Macon, Georgia; and Sioux City, Iowa. It’s a chance to look at local news ecosystems outside the often noisy environments of the east and west coasts, but generalization is difficult — particularly when looking at metro areas with populations ranging from 2 million to 125,000. In all three cities, a higher percentage of residents closely follow local and neighborhood news than do national or international news. But Pew found what counts as “local news” varies within each region. Weather was the most closely followed subject in all three cities; in Denver, traffic and crime rounded out the top three; in Macon and Sioux City, crime and education were the second and third most followed topics. …the greater digital orientation and array of providers in Denver widen the local news system somewhat with less reliance on the major legacy providers, especially the local newspaper, and a greater mix of coverage more often driven by enterprising work from journalists. The portion of the population finding that enterprising work, though, remains small. Overall interest in local news, meanwhile, is highest in the city with the most limited number of offerings and the lowest level of education and household income. And the greatest level of satisfaction with the role of the news media is expressed in the city with the least diverse population and the greatest connection to those local journalists. While making side by side-by-side comparisons of the local media is imperfect, the research offers an glimpse at how local factors like education, income, race, and broadband availability affect how a community receives its news. Here are a few highlights; make sure to dig deeper into the methodologically ambitious report for much more information on what news consumption looks like today on a local level. For those of us who spend most of our time watching or covering the transformation of journalism, it’s important not to forget how much local TV still dominates news consumption. Pew found TV was the chief source of news in each city, with people in Denver and Macon almost twice as likely to get information from TV than the daily paper. 68 percent of Sioux City residents get news from local TV, 66 percent in Macon, and 58 percent in Denver. That doesn’t mean the cities don’t provide an array of new media alternatives. Denver offered the most options, including 25 that are digital-only. Denver is home to nonprofits like The Colorado Independent, as well as 17 ethnic outlets like La Prensa de Colorado, in addition to stalwarts like The Denver Post. To contrast that, Macon has six niche publishers and Sioux City has 11. In all three cities, most residents don’t rely on non-traditional sources for information. Despite the rise in news startups and nonprofit news sites, the percentage of residents in Denver, Macon, and Sioux City who use local digital-only startups is in the low single digits. One of the biggest differences between the cities: broadband availability. In Denver, 70 percent of residents have fast Internet in their homes, opposed to 52 percent in Sioux City and 48 percent in Macon. So it might not be surprising that Pew found that 45 percent of Denver residents say the Internet is important to following local news, opposed to 38 percent of residents in Macon and 33 percent in Sioux City. The broadband divide matches up with an analogous divide in Internet use: 89 percent of Denver residents, 80 percent of Sioux City residents, and 76 percent of Macon residents use the internet. Similarly, 79 percent of people who live in Denver get local news on at least one digital device, but the number drops to 69 percent in Sioux City and 67 percent in Macon. One problem is that local news providers may need to increase their daily digital output: Just six of Macon’s 24 news sources had daily content; for Sioux City it was seven of 31 outlets. One common thread was the small percentage of people using social networks for news. In each of the three cities, only eight percent of residents said social media was “the most important” way of following news. But usage of Twitter and Facebook is likely rising. Macon in particular is interesting, as a third of residents told Pew they use social media to reach a news source, with 27 percent in Sioux City and 25 percent in Denver doing the same. Denver and Macon showed differences in local news engagement from black and Hispanic residents. In Denver, Hispanics were more likely than whites to follow local and neighborhood news. Pew also found that Hispanics engaged with local news in different ways, with 34 percent of Hispanic residents saying they commented on a local news site, compared to 22 percent of white residents. However, 56 percent of white residents said they shared a local news story digitally, while only 45 percent of Hispanics reported doing so. In Macon, black residents have a higher participation rate with local media than white residents. Black residents were more likely to watch local TV, read the local paper, and access news through social media. 43 percent of black residents in Macon have used social to access a digital-only local news source, while 38 percent of white residents had done the same. 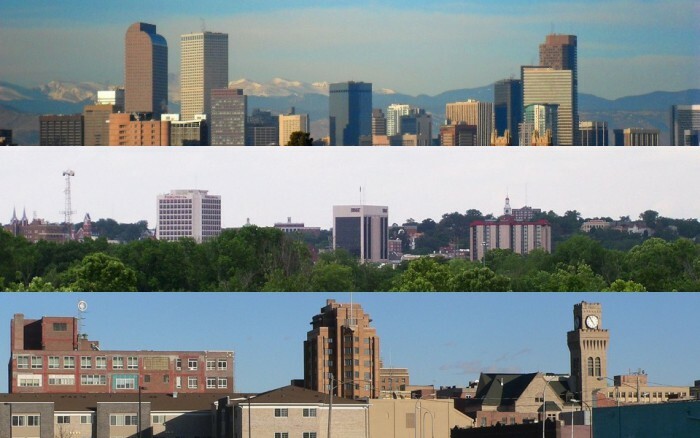 Photos of the Denver, Macon, and Sioux City skylines used under a Creative Commons license. POSTED March 5, 2015, 12:01 a.m.
Ellis, Justin. "New Pew report: In cities big and small, readers still rely on traditional media for local news." Nieman Journalism Lab. Nieman Foundation for Journalism at Harvard, 5 Mar. 2015. Web. 20 Apr. 2019. Ellis, Justin. "New Pew report: In cities big and small, readers still rely on traditional media for local news." Nieman Journalism Lab. Last modified March 5, 2015. Accessed April 20, 2019. https://www.niemanlab.org/2015/03/new-pew-report-in-cities-big-and-small-readers-still-rely-on-traditional-media-for-local-news/.